With four locations in the West Los Angeles area, Benitos offers burritos, tacos, tortas, and more 24 hours a day. 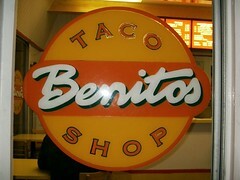 Benitos claims to be LA's original taco shop, though I don't know how true that could possibly be. They also claim to be home of the rolled taco, a.k.a. taquito. Prices are low, the floor is dirty, and the burritos are filling. Check it out, any hour of the day. The official site can be found here and the menu here. This entry is filed in Benitos Taco Shop. I'm surprised that you rated the taquitos so high. Due to that truly DISGUSTING excuse for a guacamole sauce they rate a ZERO! Gawd, I hope that guac crap doesn't show up in anything else. BTW I've only eaten at the SM/Federal branch. I would never go out of my way for a taquito, but the ones served down on Olvera Street are pretty good (but getting tourista-pricey).